When we went to Bolivia, one of the plans was the Amazon basin on this side. However, the more we researched, it seemed more impossible. This side of the Amazon is very well preserved, and at the same time, means that it is very difficult to access by regular tourists like us. So, like we did always, plans changed many times, and is now totally different than we thought…. Deleted the 3,000 words…. If you want to know our journey of planning, let’s meet up for a drink. In summary, we crossed the border from Bolivia to Brazil at Corumba and then went to Bonito-MS from there. Bonito-MS is recommended by a friend in Brazil, and we have never heard about this place before. The word “bonito” means “beautiful” in both Spanish and Portuguese, so, you imagine how beautiful this place is. Bonito is a small town, the central is only a few blocks, and the tourist sites are in the surrounding region. 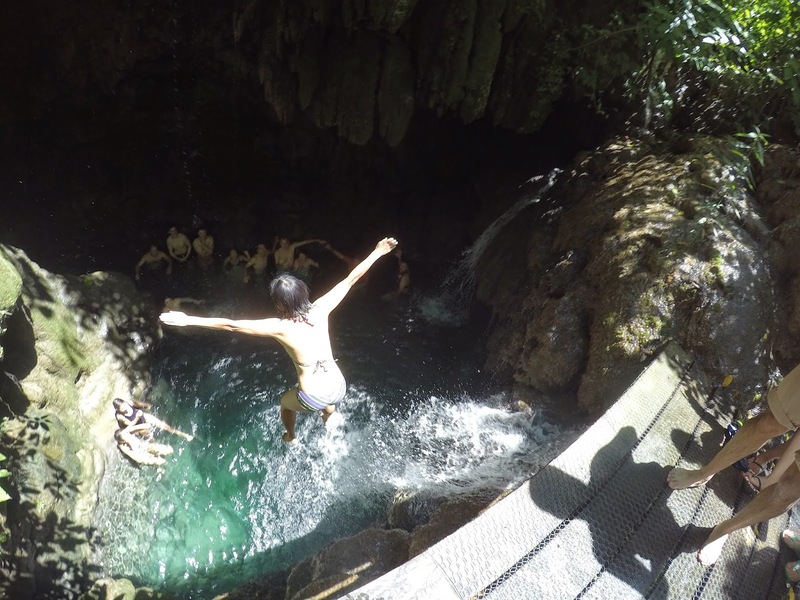 The famous spots here are all around water and caves, but we are talking fresh water rivers and natural springs, not sea water! This is very different from our usual water sports. It’s slightly more than 1 hour to arrive at Rio do Prata. There are only 8 persons in a group, we spent 4 hours walking in the forest and snorkeling in the river. 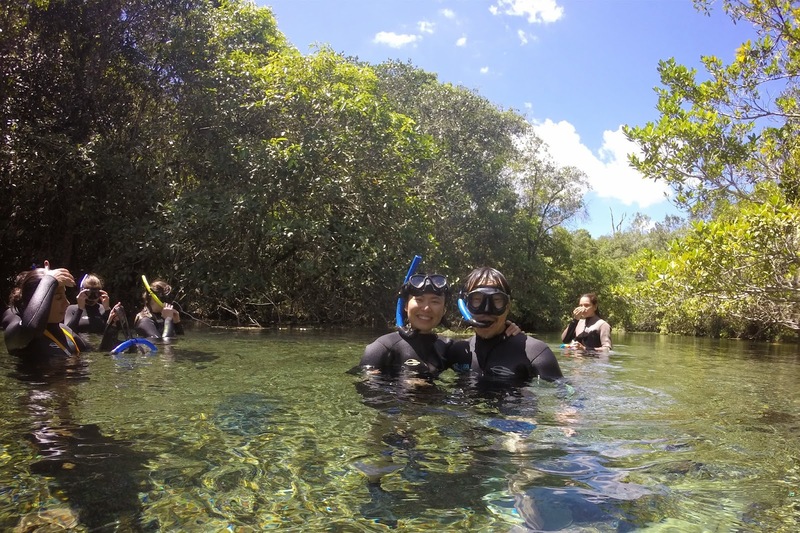 This is the first time that I hike in wetsuits and also the first time for me to snorkel in a fresh water river. This river is a natural underwater spring, and the water is so crystal clear with lots of fishes. We can see the underwater volcano in some spots and you can see the water coming out from the river bed and the water is very cold. Another thing is, the river bed is very shallow, and it has a lot of lime stone sediments and vegetation on the river bed. So, we are not allowed to use our feet and we cannot stand in the water, must always keep the floating position, and use hands to swim only. In short, with the help of the current, we are slowing floating down the river. There is a short section with stronger current, when we float through, it feels like a few minutes where you are flowing in the time current with your body totally relaxed, keep your balance and avoid the rocks, then you pass through smoothly…. This is simple trip where you walk around a big hole with 500m circumference. The hole was formed because the limestone was dissolved by rain water and the ground collapsed. Apart from seeing the big hole, we are here to watch the big and beautiful macaws. 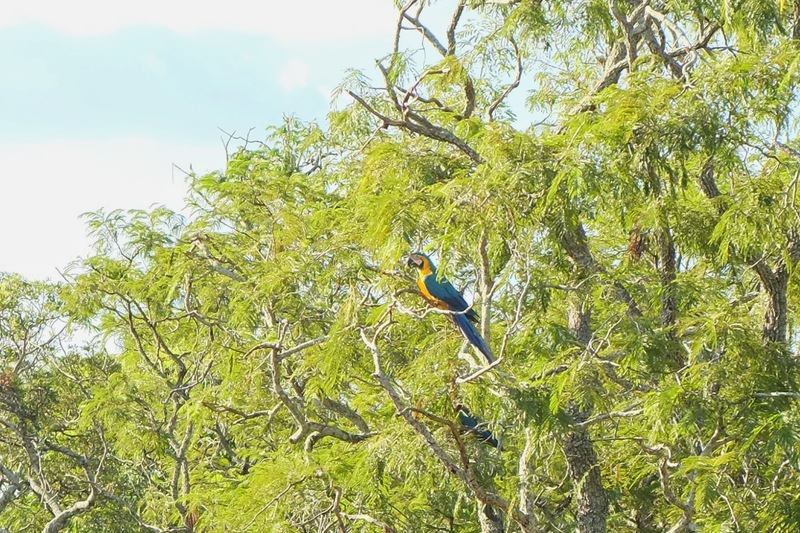 We have seen the yellow/blue macaws and the red macaws! This is the first time I see them in the wild, outside of the ocean park and a bird park. This is still water, but it is a completely different water. We walked in the forest and passed by numerous waterfalls, we can jump into all these waterfalls and be close to them! 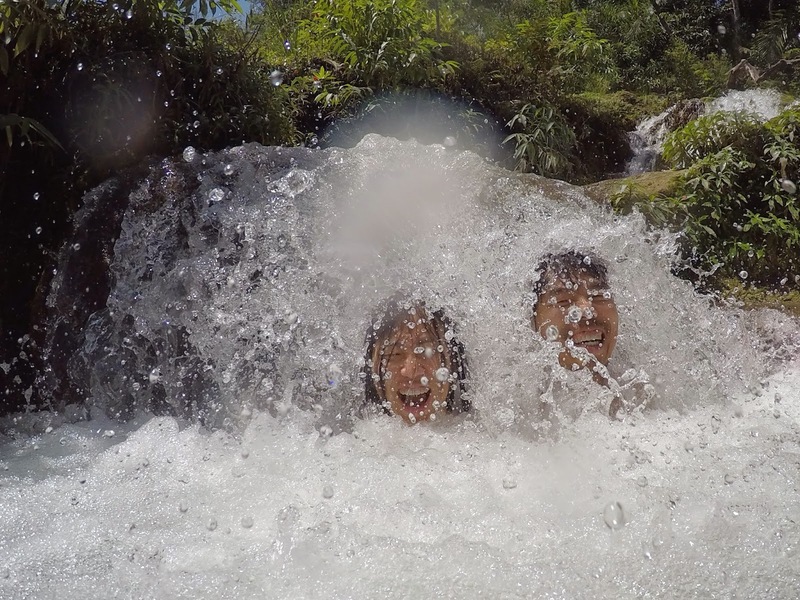 The first time I jump into the water like this, the first time for me to experience a bath under the waterfall. The water was indeed very powerful and can easily wash me away. Since I cannot swim, I did not jump into deep water, but I still really enjoyed the day. Our new friend Daniel is like a big boy, he was having great fun! In the mid-day break, more is coming, the pets of the farm owner come! It was really funny when Gigi came. When everyone were chilling out on the helmets, she suddenly came in and ask people to play with her. She even jumped into water to swim and many swam with her as well! After these two days, you can imagine how tired I was.